Unusual leg heaviness can occur suddenly while you are climbing up stairs, making it virtually impossible to continue to the top. Because heaviness in the legs can sometimes signal a serious medical condition, understand why it occurs and how it can be treated. Leg heaviness while climbing up stairs can vary from mild to severe. You may experience the sensation of needing to drag the lower part of your leg or foot. Or you may not be able to move your legs as easily or as quickly as you would like while stair climbing. You may be unable to walk on your heels, have difficulty flexing your ankle or walk with an odd heel-to-toe pattern. Additional symptoms can include tingling, pain, weakness or numbness. 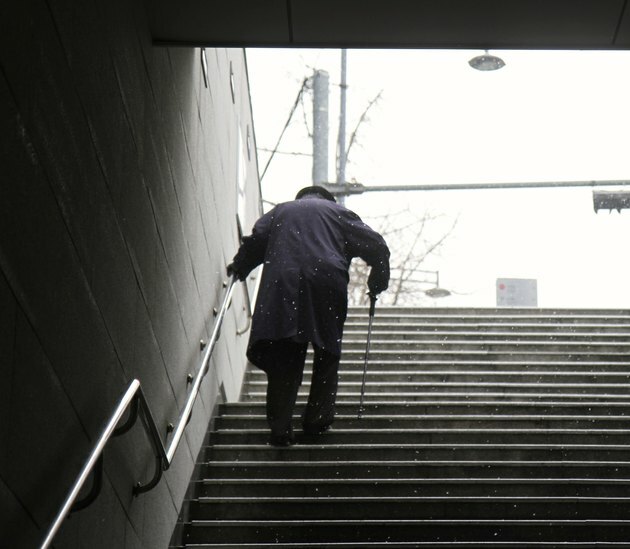 You may experience leg heaviness while climbing stairs if you overuse the muscles, cartilage, ligaments or tendons in your legs with excessive stair climbing or exercise. It can also occur if you are not accustomed to the motions of stair climbing and rapidly increase the length of time or intensity that you exercise on them. Leg heaviness may be related to medical conditions such as lumbar degenerative disease, a herniated disc or spinal stenosis. Rest and refrain from climbing steps until heaviness subsides. Elevate, ice or wrap the affected extremity with an elastic bandage if heaviness is accompanied by pain or swelling. This will help constrict the blood vessels and relieve inflammation and pain. Take an analgesic, such as acetaminophen, if necessary. A physical therapist or doctor can show you rehabilitation exercises to help restore movement. In extreme cases, such as when caused by a hernia, a doctor can surgically repair the injury. Do not ignore leg heaviness, especially if you do not usually experience it. Seek medical attention if your leg heaviness is chronic or severe, or if you develop cramping or pain in your legs. These could be symptoms of a serious medical condition called peripheral arterial disease in which arteries become clogged in your legs. This illness can increase your risk of developing serious complications, such as stroke or heart attack.